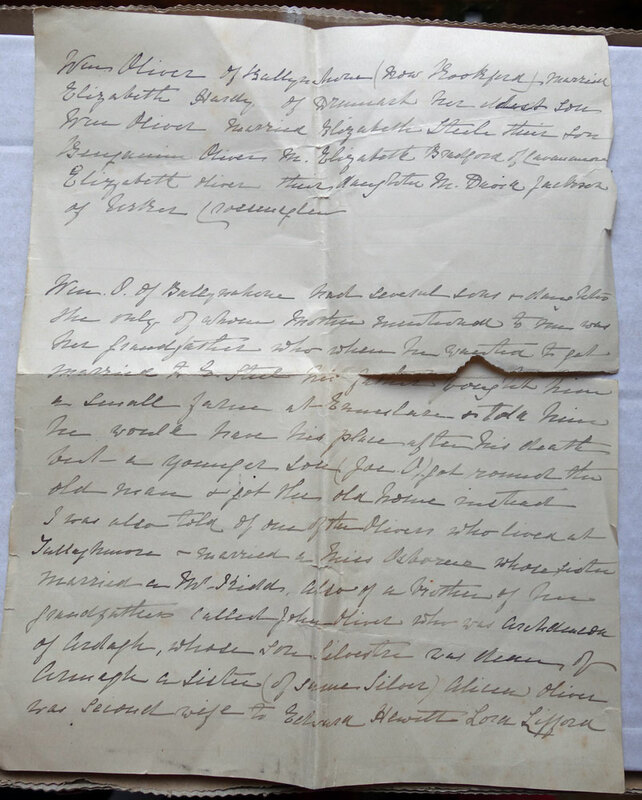 These two pages were amongst several documents which Christine Wright recently discovered at Gilford Castle. I first saw them on May 7th, 2015. Based on the handwriting as well as the content, they were written by Eliza Oliver (1815-1903). It is most likely that they were written for her granddaughter Mary Menary. 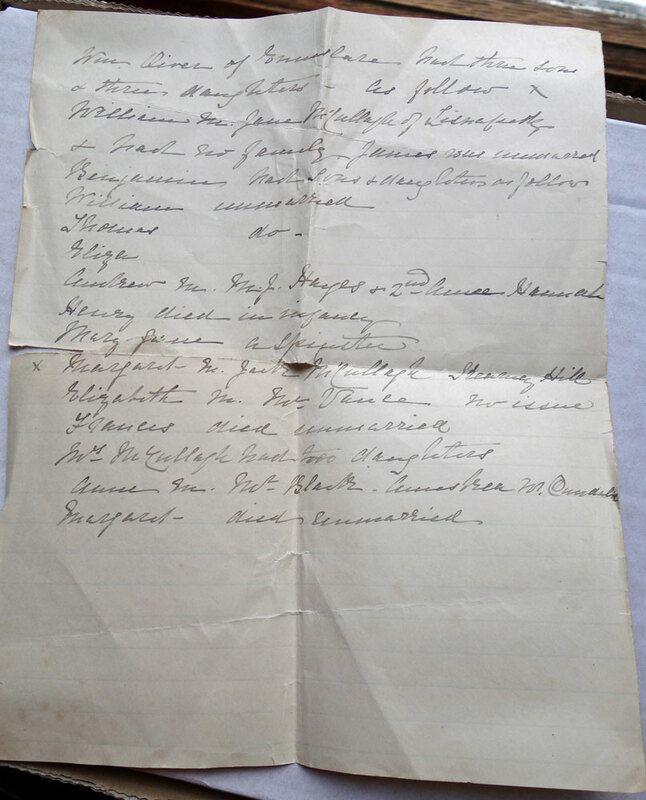 This is the oldest written version of Oliver family history that I have been able to find . Eliza was ten years old when her mother (Elizabeth BRADFORD) died, and many of the names come from what Eliza recalled from their conversations. Since her father also died five years later, this may account for some parts of this history which seem unlikely. For example, I can find no link - at least so far - between her family and the Rev. Silver Oliver. Then there are the parts that Eliza leaves out. When it comes to the names of the children of her brother Andrew Bradford Oliver, since she doesn't mention them, we are still not 100% sure whether his son William OLIVER was a son of Andrew's first wife, or of the 2nd - but at least we have one more fact to prove that there were indeed two wives. Eliza also does not mention any of our relations who were born of mixed Catholic-Protestant marriages, or any of the other descendants whose parents were not married in a Protestant church. DNA and deeds research indicates that there were several such relationships. Even so,these two simple pages are like gold in our quest for unearthing the truth. They certainly identify new paths that are now ripe for exploring. Oliver History found 2015 May 7. William Oliver of Ballynahone (now Rookford) married Elizabeth Hardy (of Drummuck). Her oldest son William Oliver married Elizabeth Steele. Their son Benjamin Oliver married Elizabeth Bradford of Cavananore. Elizabeth Oliver their daughter married David Jackson of Urker Crossmaglen. William Oliver of Ballynahone had several sons and daughters the only of whom Mother mentioned to me was grandfather who when he wanted to get married to E Steele his father bought him a small farm at Ennislare and told him he would have his place after his death but a younger son (Jos O) got round the old man & got the old home instead. I was also told of one of the Olivers who lived at Tullymore & married a Miss Osborne whose sister married a Mr. Kidd, also of a brother of our grandfather called John Oliver who was archdeacon of Ardagh, whose son Silver [???] was vicar of Ardagh a sister (of same Silver) Alicia Oliver was second wife to Edward Hewitt Lord Lifford. William married Janet M’Cullagh of Lisnafeedy. X Margaret m Jack M’Cullagh Kearney Hill. William OLIVER. I have estimated his birth date to be abt 1700. Rookford According to a version of the family tree by Blin BROWN, the Eliza OLIVER who married David JACKSON was a cousin of the Rector of Loughgall and he built Rookford for his son. Rookford Road is just a short distance east of the town of Milford, Co. Armagh. Rookford House still shows on current maps on Rookford Road, just south of Monaghan Road. On the 1830s maps, this intersection is right at the juncture of Ballynahone Bridge and at the top end of the townland of Ballynahonebeg at a bend in the road that used to exist but has since been taken out. Elizabeth HARDY NOTE: The last name is hard to decode, but HARDY is my best guess – and the surname was known in connection to an early Birch marriage – another related family in the linen business. A John HARDY is mentioned in the Brownlow Lease Book, and the name James HARDY is also around in that time frame. Drummuck is in the parish of Creggan. It is interesting that it is on the southern border of the townland of Urcher, and the western border Liscalgat - two townlands where Eliza's husband's JACKSON ancestors had resided since the mid-1700s. NOTE:It may also be that I have misread the handwriting. It could be the townland of Drummad in the parish of Armagh, just north of Ballynahonemore. This would make more sense. It is after all, where the next generation of bride, Elizabeth STEEL, hailed from, and is also close to the townlands where William OLIVER had leases. William OLIVER (abt1730-1816). Husband of Elizabeth STEEL. If he was the eldest son, then my estimated birth date is incorrect. He would have been born bef 1724, and would have lived to be 93 years old. NOTE: This William OLIVER also held a lease to 53 acres of land in Brootally, as well as 57 acres at Enagh & Killynure, and 31 acres at Farmacaffley. Urker is in Creggan Parish near Crossmaglen, and was the long-time home of Eliza JACKSON née OLIVER (1815-1903). Sons – so far I have attached the following as children of William OLIVER and Elizabeth HARDY: Benjamin OLIVER (1724-1770); David OLIVER (1725-1806); Joseph OLIVER (1727-abt 1795) and William OLIVER (abt 1730-1816). There may have been more – possibly an Andrew, possibly a James. Ennislare is in the parish of Lisnadill. It is on the southern border of Farmacaffley, which in turn is on the eastern border of Ballynahone beg. This is significant since the OLIVERs who lived near Armagh City seem to have moved outwards from the first known settlement here in dating back to before the 1664 Tithes records. At that time, the townland of Farmacaffley was known as Sherranmcaghully and was the residence of an Andrew OLIVER. Joseph OLIVER (aft 1764-btw1796-1798), husband of Jane OATS, and father of Mary OLIVER; Elizabeth OLIVER and John OLIVER. The old man was William OLIVER, husband of Elizabeth HARDY. It is hard to say where this old home would have been. Ennislare and Ballynahonebeg are both possibilities. This would likely be Joseph OLIVER (1764-1837), son of David OLIVER and Susannah WALKER..
 Tullymore is in the parish of Armagh, and is on the northern border of Ballynahonebeg. Catherine OSBORNE? This is the only evidence that I have for the surname for Joseph OLIVER’s 2nd wife, Catherine. Given that Osborne KIDD ended up owning Tullamore (Joseph and Catherine had no surviving issue), this is quite likely. This may a bit scrambled here. Agnes OSBORNE (abt 1749), daughter of Capt. Ralph OSBORNE was a wife of Benjamin KIDD, and their descendent ended up owning Tullamore. The only OSBORNE-KIDD marriage I have so is Benjamin KIDD (1745-1823) = Agnes OSBORNE (abt 1749). A brother of Eliza’s grandfather would have been a son of William OLIVER & Elizabeth HARDY. This makes no sense for two reasons. Firstly, there is no mention of a son named John OLIVER that have found so far in my deeds work. Secondly, his parents were not William OLIVER and Elizabeth HARDY. Rev. John OLIVER (1720-1777). So far, I can find no blood relationship between the two families. The geography is a fit, and also a family crest involving fish, but nothing more – at least so far. The parents of Rev. John OLIVER were Robert OLIVER (1671-1738) and Suzanna KNIGHT. If (and this is a big if), the William OLIVER who married Elizabeth HARDY were either a brother or nephew of the Robert OLIVER (1671-1738), then many things would be explained. John OLIVER (1720-1778) was Archdeacon of Ardagh. Rev. Silver OLIVER (1778-1844) NOTE: In Eliza’s handwriting the name Silver looks like Silvertre. William OLIVER (1730-1816). NOTE: There may have been a 4th son – Andrew OLIVER of Brootally who married an Anne HANNA in 1804. He was most likely a relation, but maybe not on this part of the branch. Lisnafeedy, Parish of Eglish, Co. Armagh. NOTE: Lisnafeedy is near Killylea in Eglish Parish and is also two townlands west of Mullinture – a townland with historic OLIVER roots as early as 1703. It is possible – perhaps even likely – that William OLIVER had a 2nd wife with whom he had a son, another William OLIVER. James OLIVER. I suspect that he was the James OLIVER (1853) of Brootally. It is possible that he had a “marriage” that was unrecognized by the church, and he is likely the father of John OLIVER, who in turn was the father of John OLIVER (1841-1909) who married Margaret ROCKS. Benjamin OLIVER (1765-1831) – he was my 4Xg-grandfather, and he died at Killynure. He was the father of Eliza OLIVER (1815-1903), the author of this tree. William OLIVER (abt 1810-1873)may not have married, but he had a house-keeper named Sarah ROCK to whom he left £50. She may have been - or not been - more than a housekeeper. Eliza JACKSON née OLIVER (1815-1903), the author of this document. Anne HANNA (1822-1891), the mother of 5-6 of their children (one is still not certain). Henry OLIVER. He would have been born and died between 1818-1821. Mary Jane OLIVER (1821-1875) NOTE: This is Mary Jane Oliver of Cavananore. Jack M’CULLAGH aka John McCULLAGH of Kearney Hill. Thanks to a deed, ROD 779-332-527657 Oct 1816., I now have his brothers named: Samuel McCULLAGH and Robert McCULLAGH. The family was from Cladymore aka Clady More - a small village and townland in County Armagh, within the Armagh City and District Council area. Kearney Hill is in the townland of Cavanacaw, Parish of Lisnadill. The townland is on the southern border of Ballynahonemore – where there was an historic presence of OLIVER families. It is on the NW corner of Cavanacaw Rd. & Drumcaw Rd. This is south of Armagh, between B31 - the road to Newtownhamilton and A28, the road to Newry. In the historic maps of this spot, there was a house and orchard. Although a John McCULLAGH, a linen merchant married to a Jane OLIVER, lived there in 1818, there is no trace of them in Griffiths Valuation. Elizabeth OLIVER. In the First Presbyterian Church of Armagh, her address was given as Ballynagalliagh- a townland in Lisnadill that is on the southern border of Ennislare, the home of her parents. Frances OLIVER (bef 1770-bef 1827) NOTE: I have an abstract of her will probate from 1827. Is suspect some of the memorials of deeds referred to her as Francis – in error. Aka Jane McCULLAGH. She died sometime after 1801. Anne M’CULLAGH. There is a record of an Anne BLACK (1811-1873) who died in Dundalk. This is a possibility.